The iCM4+ is solid. 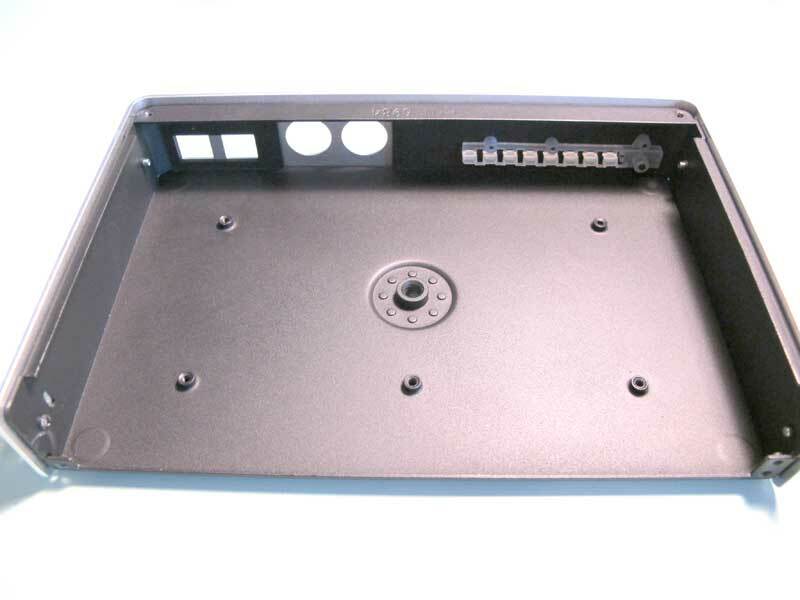 Full metal chassis with recessed connectors. It weighs one kilo exactly (2.2 pounds). Most of that weight if for the chassis, which is made of three parts, and the electronic printed circuit board is screwed to the bottom part (in the picture below). This thing is built to last! The unit measures roughly 21x14x4 cm. It is quite large, but this is essentially due to the number of connectors: 8 DIN Midi connectors (4 ports), 3 USB type B (to USB hosts like a computer), 1 USB type A (as USB Host for Midi equipment), one RJ45 network connector (Ethernet), and one power connector. The included power supply is 12 Volts/16 Watts (3.0 Amps). This is needed to provide power to connected USB devices, and of course to provide power to the iCM4+. All the connectors are affixed to the printed circuit board and the solder points are all top quality. There are no moving parts on the whole thing, except for a button on the front (pushing a button on the PC board). External screws are recessed. The circuit board is very clean. Well spaced components and well thought signal path should keep interference to a minimum. Everything is logically placed. The board is large because of all the connectors and that gave the engineering team a lot of space to do a neat component placement. The power area integrates a good voltage regulator at 5 volts and another one for 3 volts (or 3.3V ?). The design is classic and the traces are wide. Remember that the iCM4+ is hooked to a 12 volts power brick that take care of AC and rectification. So the internal power processor’s role is voltage sub-division and fine power regulation. The midi connectors (2 in front and 6 in back) are standard DIN 5 pins. 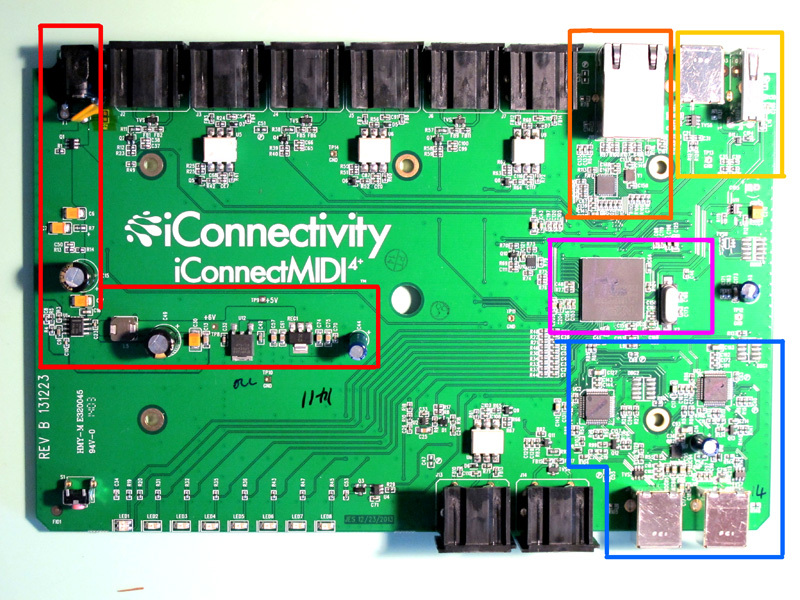 As required by the MIDI specifications, the MIDI IN ports only have pins 4 an 5 connected. Pin 2 (ground or sleeve) is not connected. All pins are soldered to the circuit board for solidity. The MIDI IN circuit is standard with its opto-isolator (white ICs in the photo). The MIDI OUT circuits use pin 2 for shielding, as required. The iCM4+ seems to have the proper inverters in place for correct Midi signal processing. The Midi connectors could easily be modified to provide power through pins 1 & 3, if need be. The network connector is linked to a Teridian 78Q2123 Ethernet Transceiver and then to the main processor. Why a network connector? 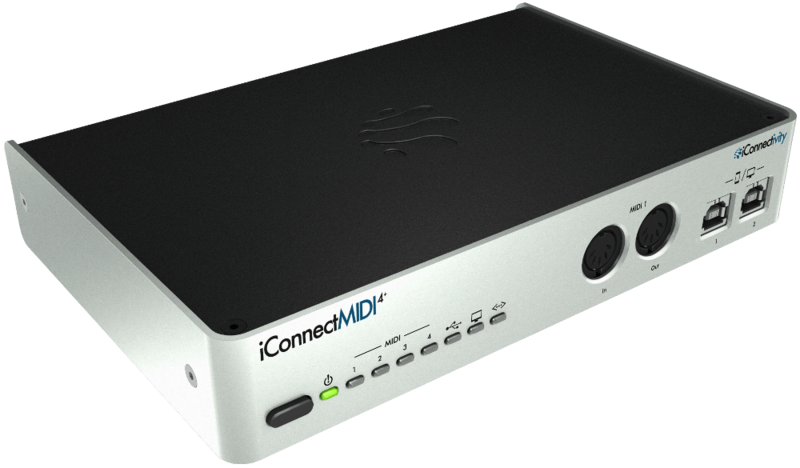 The ICM4+ can transmit (and receive) Midi to a connected network. Any device on that network will be able to see and use that Midi device. This includes wireless access… Wow! More on that in the actual usage review (in the next post). The first connector is a standard USB type B connector that is generally used to connect the ICM4+ to a USB host, usually a computer. The USB connector is linked directly to the main processor. Next to it, on the extreme right, is another USB connector, but this one is type A, so logically, the ICM4+ uses it as a host, meaning that you can connect your Midi keyboards here, using a USB port hub if you have more than one. Note that the USB type B connector does not provide power. So the logical choice is to use it to connect a computer. The front USB connectors are linked to a pair of NXP LPC11U series Arm Cortex-M0 processors tailored for USB communication. They are USB 2.0 controllers. They are connected to the Main Processor for data handling. Note that the one on the left provides 2.1 Amps at 5 Volts (12 watts – enough to charge an iPad) and the one on the right provides enough power to charge an iPhone, etc. These USB connectors are type B, so you will need a special cable to connect an iPad or iPhone (or iPod). iConnectivity provides one such cable with the ICM4+. I would guess that there is some fancy programming in the LPC11U processors to properly handle the interface with an iPad or iPhone because the ICM4+ is able to charge the device, exchange Midi data and exchange sound data with the apple devices and also make them visible to other connected equipment all the way through to the network. Wow! To the bottom left you can see a series of LEDs and the front MIDI port, which is built like the ones on the back of the unit. 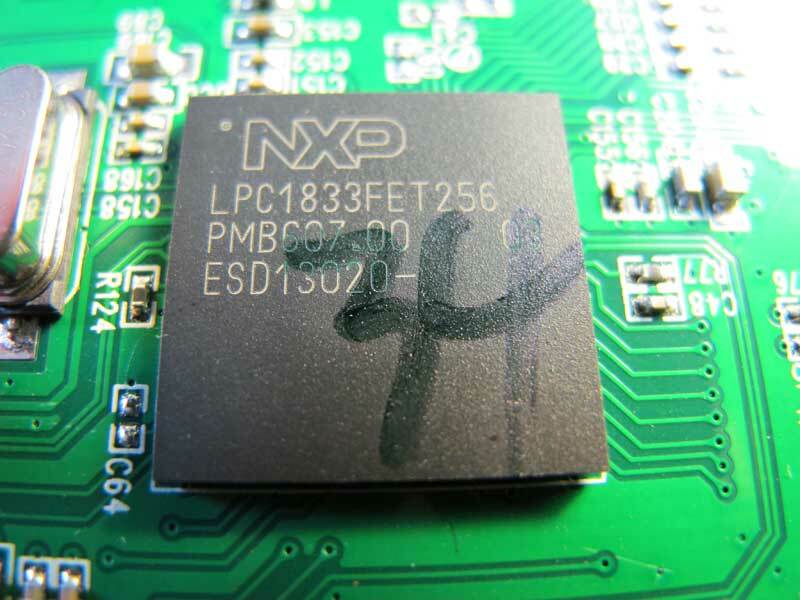 I would be curious to see the programming in those NXP processors! No port is directly exchanging data with another one. All communication is handled by the Main Processor (and the pair of USB optimized LPC11U). There is extensive configuration options available through the Mac (or PC) and iOS interface. Preliminary testing let me see some of the configuration options and so far I have been very impressed by the flexibility of the iConnectMIDI4+. If you think that this is an enthusiastic positive review, wait ’till you see the software/usage review! This entry was posted in Electronics, Music equipment and tagged ICM4+, iConnectivity, iConnectMIDI4+. Bookmark the permalink. You ever going to do an easy midi interface for those of us who have the original Vortex? Sure would be nice, really want to go wireless so I can move around a bit. Rev B!! Wow, the guy who designed that must have some experience doing this sort of thing, usually you don’t see Rev B in production. I’m sure someone with a good deal of experience was involved. As I wrote, this is a very clean design! You made the hardware design team blush, and the board layout guy, well he is over the moon. I had to dismantle my iCM4+ the other day to re-solder the power socket. After just one morning of use the power connection became faulty. I noticed that gently wiggling the power plug would cause the device to power off. After opening up the iCM4+ I could see the problem immediately. The -ve connection of the power socket was not soldered to the PCB, but rather covered in some black gooey stuff that was expected to hold the contact in place. Wiggling the power plug would cause this connection to break and spark as it connected/disconnected from the 12V power. It looks like this was a last minute design alteration as the power socket does not properly fit the PCB. There is also a capacitor soldered across the power rails that looks like it was thrown in at the last minute as it also was not neatly incorporated into the PCB design (one leg soldered to the PCB and the other directly to the back of the power socket). So although the rest of the PCB looks great, I wouldn’t give these guys too much praise, as the power socket design is actually extremely sloppy! I’m a bit disappointed with this as the rest of the unit’s construction appeared to be pretty solid. Ah! Well… I too have had to make last minute changes to some of my stuff, even after production began. I had noticed the ceramic capacitor in the power input too. I figured some extra filtering became necessary. Could be that the power brick got changed at the last minute, or the manufacturer decided he had a “better deal”! Too bad yours was loose. I’ll recheck mine. I’m sure iConnectivity will take notice. That doesn’t change my views on the design. I still think it’s great. After more reflexions, i can’t believe that the ICM4+ can do everything in the same time, i waiting the first stress test (Audio, network and USB works in the same time). So less data memory and MIPS! After more reflexions, i can’t believe that the ICM4+ can do everything in the same time, i waiting the first stress tests (Audio, network and USB works in the same time). in french please to HELP configuration !..